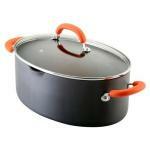 This Cuisinart Multi-Purpose Pot follows the streamlined stainless steel look of the Chef's Classic product line. It has a modern, minimalist design and is just as functional as the rest of the set -- maybe even replacing a few pots & pans altogether. Mauviel's Cuprinox frying pan has such a fast reaction time to heat adjustments that you'll be able to perform tricky feats like making French omelets correctly, instead of American style. This makes a cast iron pan look like a frontier relic. Let's pretend: It's crunch time. You have to choose. Your kitchen is on fire and you can only save one pan... No, I'm sorry. Say you're paring down. You're allowing yourself to only keep one pan out of all your cookware. Which will you choose? The "Contemporary" line of cookware from Calphalon certainly draws attention for its unique shaped saucepans, such as this shallow model saucepan and lid combo. We all have that one pan that we use to cook just about everything. The one that we'd grab if the house was burning down rather than risk losing it. An impressive look accompanies the precision of cooking with copper-clad cookware in the Cop-R-Chef 4 Quart. 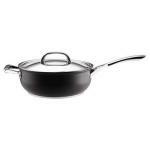 The shine of this pan will get your attention; the superior performance will hold it, providing years worth of service, meal after meal. The shine of the pan will catch your eye. 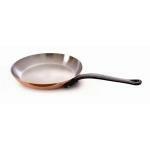 Made from 18/10 stainless steel, the cooking surface is hand polished, won't react with food, and is a snap to clean. 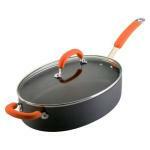 The exterior has a mirror finish made of magnetic stainless steel, a perfect match for induction cooktops. 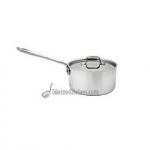 The All-Clad company has been manufacturing stainless steel professional cookware for over 30 years. They have more recently incorporated hard-anodized aluminum to the extensive product line. Rachel Ray created this eight quart oval pasta pot. The shape saves space on the stove and allows you to cook pastas without breaking the noodles.